"Scott Baker has written a valuable, important book which offers practical, yet dynamic and untapped solutions that could be major game changers for the US, for struggling states, cities and counties. Better, these solutions serve the 99% and undermine and take away power from big banks and finance companies. Arthur Clarke said, "Any sufficiently advanced technology is indistinguishable from magic." Baker's ideas may look like magic but they are rooted in visionary, solid thinking and ideas." 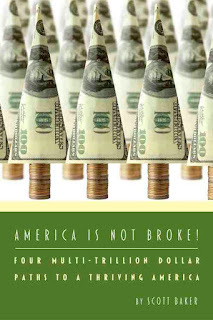 "Scott Baker, a reliable and powerful supporter of the public banking movement, has now taken his writing and activism to the next level in writing America Is Not Broke! This book dispels the myths about public banking and our monetary system in general. It is welcome outside-the-box thinking and I heartily endorse it." "For more than four years Scott Baker has been challenging the false narrative of Wall Street, the Federal Reserve and the deficit hawks that led America and the world into economic catastrophe. America Is Not Broke! Four Multi-Trillion Dollar Paths To A Thriving America will take its well deserved place in the literature of an America resurgent, an America in which the vast common wealth of the American people is put to work to take back our stolen economy, politics and future from the parasites in pinstripes." “America is not broke!" reveals the mess that is our current monetary system, and presents some essential reforms that would allow us to reclaim democratic control over the power to create money." producer of the Manny Manhattan News cable television program.